Design based on the WW1 lapel badge issued to all those honourably discharged from Britain's armed services as a result of their wounds. Commemorating all the war wounded, whether mentally or physically, scarred by the conflict. 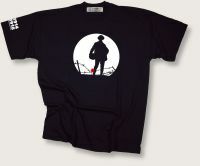 One of a series of designs marking the centenary of the conflict. T-shirts as 'Testaments of War' to remember the courage and the sacrifice, to resist the deadly causes and lethal consequences.